The general goal of the immobilization procedure is the attachment of one of the interactants to the sensor surface. This immobilization is permanent in the form of a covalent bond or transient by means of capturing. 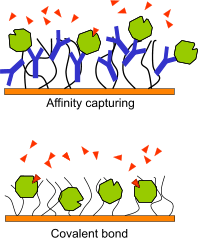 With surface plasmon resonance one of the interactant is attached to the sensor surface as opposed to ITC (iso-thermal calorimetry) and MST (microscale thermophoresis). The immobilization is in some publications seen as a real drawback of SPR (1),(2),(3). One drawback of the immobilization is that the biological activity of ligand can change because the covalent bond is in the active site. In addition, the covalent bond will restrict the free movement of the ligand. Karlsson et al. showed that with proper experimental design the kinetics measured with SPR are the same as with solution based methods (4),(5). The design of the experiment includes the choice of ligand, sensor surface, immobilization chemistry and ligand density. However, it is always necessary to evaluate the biological activity of the compounds regardless if you use SPR or a solution based technique. (1) Edwards, P. R. et al Kinetics of protein-protein interactions at the surface of an optical biosensor. Analytical Biochemistry231: 210-217; (1995). (2) Edwards, P. R. and Leatherbarrow, R. J. Determination of association rate constants by an optical biosensor using initial rate analysis. Analytical Biochemistry 246: 1-6; (1997). (5) Zeder-Lutz, G. et al Thermodynamic analysis of antigen-antibody binding using biosensor measurements at different temperatures. Analytical Biochemistry 246: 123-132; (1997).